Pir Shams was born most probably at Sebzewar, a town in Khorasan, lying 64 miles west of Nishapur. 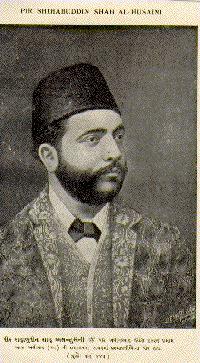 His father Sayed Salauddin had been deputed in Baltistan by Imam Kassim Shah, who most probably came into the contact of Taj Mughal in Badakhshan. Kamaluddin Mujahri of Sebzewar writes in "Malfuz-i Kamalia" that Pir Sayed Muinuddin Hasan of Sebzewar of Ajmer had a meeting with Sayed Salauddin in Sebzewar in 560/1165. It is recounted that Pir Shams had gone to Badakhshan with his father at the age of 19 years, and thence he proceeded to Tibet and returned back to Sebzewar. It is said that after the death of Sayed Salauddin, Imam Kassim Shah had commissioned Pir Shams as the hujjat of Sind and Hind at Daylam for the Indian mission, and he also refers to the Imam that: "Adore sincerely the true guiding light manifested in the person of Kassim Shah, the Lord of the time." (vide "Garbi", 5:17). The earliest description of Pir Shams is found in the treatise of the biographies of Sufis, entitled "Nafahat al-Uns" (comp. 883/1478) by Nuruddin Abdur Rahman Jami (817-898/1414-1492), the last classic poet of Iran. Nurullah bin Sharif Shushtari (d. 1019/1610) in his "Majalis al-Mominin" (comp. 1013/1604) traces his ancestry back to the Ismaili root. Some details are also found in "Tarikh-i Firishta" (comp. 1015/1606). The great Sufi saint Bulleh Shah (1680-1758) also referred to Pir Shams in his Sufic poetry. It is indeterminable point in the modern sources, when Pir Shams was born? The extant materials however do not allow one to draw a safe conclusion. His death in 757/1356 however is indisputable, based on the plaque at the mausoleum in Multan. The most confusing and unsolved point is to locate his date of birth. Most of the scholars concur in his age for 115 years, but it however seems that Pir Shams had lived to an advanced age beyond 115 years. Sayed Bawa Ahmad Ali Khaki writes in his "Dar-i Khuld-i Bari" (Ahmadabad, 1905, p. 123) on the basis of an old manuscript that the span of Pir Shams's life was for 171 years. If the date of his demise in 757/1356 may be considered genuine, it means that his birth would have been taken place around 580/1175 during the period of Imam Ala Muhammad (561-607/1166-1210). The genealogy of Pir Shams given in the "Shajara" which is preserved in the shrine at Multan, indicates the birth of Pir Shams in 570/1165, which also gives close support to this view. Before we proceed, it must be noted that in India, there are many instances of the persons having long life-span in that period. The western scholars however should not surprise to know Pir Shams having lived to an advanced age of 171 years. The examples of long span of human life are also recorded in the annals of Europe. For instance, Catherine, the countess of Desmond, who died in 1604 at the age of 140 years. Thomas Parr died in 1635 at the age of 152 years. Henry Jenkins died in 1670 at the age of 169 years. Another documentation is that of Jacobsen Drakenberg (1626- 1772), whose age was 145 year and 325 days. Prof. E. Metchnikoff, an eminent biologist also admits 185 years age of St. Mungo of Glasgow. For further details, vide "The New Encyclopaedia Britannica" (1990, 15th ed., 20th vol., p. 428) and "Encyclopaedia of Religion and Ethics" (1959, 4th ed., 1st vol., p. 182). The readers may refer "Akhbar al-Akhayar" (comp. 998/1590), in which the life-spans of Shaykh Shahi Mu'itab (d. 658/ ), Sayed Shamsuddin Zahir (d. 741/ ), Alaluddin Qoraishi (d. 730/ ), Makdum Jiv Qadri (d. 1000/ ), etc. have been mentioned above 150 years. We will however touch here the contemporary activity of Pir Shams. He arrived from Daylam to Badakhshan, where he is said to have brought many followers of Momin Shahi sect into the Ismaili fold. He visited Gilgit and proceeded to Tibet and as far as the ranges of the Himalayas. He came back to Ghazna, where he deputed the local converted prince to Badakhshan on mission work. Pir Shams also converted a bulk of the Hindus during their Dasera festival after singing 28 garbis (songs) in a temple for ten consecutive nights. According to the ginans, Pir Shams had sung the garbis in a village, called Analvad. W. Ivanow places its location in Gujrat, called Anilvad, not far from Ahmadabad. In fact, it is Annhilvad and not Anilvad, situated about 66 miles to the north of Ahmadabad. It is also recounted that the village was Anwalvad, named after a Jat clan, Anwal in Multan, whose glaring festival of Dasera was famous in Punjab. The garbis had been composed in Gujrati style, reflecting the culture of Gujrat, and therefore, the location of the village in Multan seems almost doubtful. He had also visited Kashmir in 715/1316 and converted the Chak and Changad tribes, thence he proceeded to Multan in 725/1326 for the first time. Zakaria Qazwini writes in his "Asar al-Bilad wa Akhbar al-Ibad" (comp. 661/1263) that, "Multan is a large, fortified and impregnable city, with a temple which is to the Hindus a place of worship and pilgrimage as Mecca for the Muslims. The inhabitants are the Muslims and Hindus, but the government is in the hands of the former. The chief mosque is described as being near the temple." In Multan, many miracles of Pir Shams are reported, but these are not potential for historical value. It is therefore difficult to penetrate through the mist of legends, which formed even during the lifetime of Pir Shams and thickened rapidly after his death. The most popular miracle was the bringing down of the sun on earth, which earned him an epithet of taparez (burning) in Punjab. The word Taparez is so coherance with that of Tabriz that the former began to be pronounced as Tabriz, contriving a wrong theory to merge these two into one. Since Pir Shams and Shams-i Tabriz were proximate to each other in time, it is probable that Pir Shams, also known as Shams Taprez had been confounded with that of Shams-i Tabriz. It has been heretofore discussed that Shams-i Tabriz, the master of Jalaluddin Rumi was died in Koniya on 645/1247, engendering to the rise of a false tradition of Koniya to Multan, i.e., Shams-i Tabriz had gone to Multan. In sum, the nut of Koniya and the bolt of Multan had been patched to contrive a new tradition indicating these two figures same and one, which is absolutely untrue. It however seems that Pir Shams visited lower Sind, and travelled through the riverline belt of the Indus, and reached Uchh Sharif most probably in 727/1328, which was his mission centre. He deputed many dais in China, Tibet, Badakhshan, Kashmir and Gujrat. His mission was mobile, and is said to have gone as far as Nepal, known among the Indian Buddhists as Chinab-Nagari, designating the northern India as a part of China. Pir Shams also visited Rajasthan, and according to his one ginan (no. 70), he embarked from Uchh with his two disciples, Vimras and Surbhan. He alighted at Gudi Vilod, near Gujrat, and thence proceeded to a forest, and preached a bulk of the untouchables. He identified himself as Satgur Shams and the Light of Pir Satgur to give coherence to his mission, where the name of Pir Satgur was almost familiar. He then arrived in a barren land and reached in the middle of Malwa, where he initiated the servile caste and the Abheras and Bhils. Pir Shams also converted the Hindu Bhambi, and spread his mission as far as Ganges. The oral tradition tells us that a certain Ransi, whose family adhered Pir Satgur, also became a disciple of Pir Shams. His son, Ajmal (or Ajay Singh), the father of Ramdeo, continued to revere Pir Shams. After visiting Junjala, Jaitgarh and Karel, Pir Shams proceeded to Bichun and Sakhun in Jaipur-Ajmer region. After having initiated Khiwan and Ransi, he went back to Multan. The Nyariya (perhaps Nizaria) of Rajasthan still claim that they originated from Multan and regard Pir Shams as their master (guru). In the 15th century, the Sirvi caste of the Jaitaran, Bilara, Pali region, had accepted the teachings of a female saint, known as Jiji Devi, who was also a disciple of Pir Shams. The Prahlad panthi in Jodhpur, Nagaur and Bikaner as well as the Jasnathi in Bishnoi have a devotional literature, showing the Ismaili traits and seal (chhap) of Pir Shams and Pir Sadruddin etc. The Ismaili dawa in Rajasthan is almost blanketed in mist. The French scholar, Dr. Dominique Sila Khan of Jaipur, however, is working on the Ismaili dawa in Rajasthan, and gathered very useful historical clues. It is hoped that her labour shall procure worthy informations, and throw a possible flood of light. Meanwhile, the readers may refer her write-up, entitled, "Ramdeo Pir and the Kamadiya Panth" (cf. "Folk, Faith and Feudalism" ed. by N.K. Singhi, Jaipur, 1995, pp. 295-327), and "L'Origine Ismaelienne du culte Hindou de Ramdeo Pir" (cf. "Revue de L'Histoire des Religions", Paris, 1993, ccx-1, pp. 27-47). The most prominent among them was Ramdeo of the low castes. Being influenced with the teachings of Ismaili Pirs, he preached in Gujrat the doctrines of Satpanth (true path), but due to a setback in the mission, the followers of Ramdeo retraced their steps towards the fold of their former creed, or cultivated a different cult in India. For details, refer "Ramdeo Pir: A Forgotten Ismaili Saint" (Sind Review, Hyderabad, vol. 32, April, 1995, pp. 24-29) by Mumtaz Ali Tajddin S. Ali. The influx of Muslim immigrants into India increased greatly as a result of the Mongol incursions on the Islamic world. We hear of large colonies of these Muslim migrants in different quarters. With the settlement of the Muslims in India, conciliation and concord between the various culture-groups was not only a moral and intellectual demand, but an urgent social necessity. The Muslim conquerors had established their political supremacy, but they could not continue to rule while the majority of their subjects differed from them in race, language, religion and culture. The ulema class rarely appreciated the change in the moods of time and seldom tried to reconstruct their religious tendencies according to the needs of the hour. The Muslim mystics, however, rose to the occasion and released syncretic forces which liquidated social, ideological and linguistic barriers between the various culture-groups of India. The mystics adopted an attitude of sympathy and understanding between all cults and creeds. This broad outlook helped in breaking that spirit of mistrust and isolation which honeycombed relations between the various culture-groups of India and paved way for reapproachment at all levels. The mystics looked upon all religions as different roads leading to the same destination and never approved of any discrimination or distinction in human society which was one organism for them. The use of large number of Indian words, phrases, idioms and similes in the contemporary literature indicates the extent to which social contacts had developed. Prof. Gibb writes in "An Interpretation of Islamic History" (cf. "Journal of World History", 1st vol., no. 1, p. 59) that, "From the 13th century, Sufism increasingly attracted the creative social and intellectual energies within the community, to become the bearer or instrument of a social and cultural revolution." Perhaps in no other country were the effects of this social and cultural revolution so marked and so far reaching as in India. The early Indo-Muslim mystics believed in a pacific and non-violent approach towards all problems of human society. Forces, they said, created more problems than it solved. They tried to impress, both by precepts and examples, upon the minds of their followers the fact that a true mystic should always strive for creating love and affection in the hearts of men. "Placate your enemies," was the advice which Shaykh Farid gave to his disciples. "Do not give me a knife," he once told a visitor, "Give me a needle. The knife is an instrument for cutting and the needle for sewing together." Ziauddin Barani thus very significantly remarks in his "Tarikh-i Firuz Shahi" (p. 344) that as the result of the teachings of these mystics, "vices among men had been reduced." Hence, the eagerness of the Muslim mystics to establish closer relations with the Hindus, had faciliated a fertile ground for the Ismaili dais to propagate their faith in India. Among the Sufis, there existed four principal orders in India, viz. Chisti, Qadari, Suharwardi and Naqashbandi. The period of Pir Shams was thus noted for the several skilled exponents of Sufi thought, therefore, he launched his brisk and pervasive mission during the eve of the growing Sufi circles in Punjab. In the villages of Punjab, he mostly converted the Aror or Rohra, a leading caste in south-western part of the Punjab, i.e., of the lower reaches of the five rivers and below their junction, extending through Bahawalpur into Sind. They were mostly cultivators, and their large portion on the lower Chinab were purely agricultures, while in the western Punjab, they were mostly tailors, weavers of mats and baskets, makers of vessels of brass and copper and goldsmiths. Pir Shams appointed musafir (one who travels) in different regions to collect the religious dues, and also built prayer-halls (khana) and appointed their mukhis (derived from mukhia means "foremost"). He also introduced certain rituals, and his followers mostly in Punjab and Kashmir recognised themselves as gupti (secret ones). Pir Shams passed away in 757/1356 and was buried at Multan. His mausoleum is located about half a mile to the east of the fort site, on the high bank of the old bed of the Ravi river. His shrine was built by his grandson and was rebuilt by one of the Ismailis in 1718. The tomb is square, 300 feet in height surmounted by a hemispherical dome. It is decorated with ornamental glazed tiles. Pir Shams is acclaimed as a great preacher and composed many ginans in different Indian dialects. It is also possible that his local disciples had received the first hand marrow of his teachings in few places, and transformed them creatively into the ginanic form. These are the rich reservoir of religious teachings and great treasure house of Sufi thought, giving a very comprehensive idea of the prodigality of Sufi symbolism. He used with supreme skill the languages of the country folk and employed them to interpret ideas of natural beauty and of religious philosophy. In fact, Pir Shams was a man steeped in an understanding of the mystical teaching of Islam. The recent diligent research has brought to light that he was the most earliest, rather the first Punjabi poet, and also made rich contribution in the growth of Urdu language during its infancy. He had a faculty of expressing the truth in the local languages with appropriate turn of phrase and picturesque metaphor. After Pir Shams, his son Pir Nasiruddin (625-764/1228-1362) continued the mission mostly in Punjab and died in Uchh. He was followed by his son Pir Sahib'din (650- 775/1212-1373), who lived in the garb of a Hindu saint, and made a large proselytism. He had seven sons, viz. Pir Sadruddin, Sayed Ruknuddin, Sayed Badruddin, Sayed Shamsuddin II, Sayed Nasiruddin, Sayed Ghiasuddin and Sayed Nasiruddin Qalandar Shah. Returning the thread of our narrative, it appears that Kassim Shah passed a darwishlife in the mountainous regions of Azerbaijan. He was fond of hunting in the woods, and used to travel in different towns and villages, sometimes for a long time. 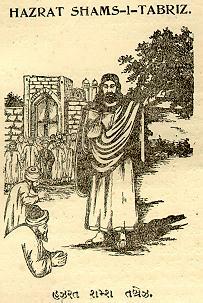 Upon his death, most probably in 771/1370, the Imamate devolved upon his son, Islam Shah.